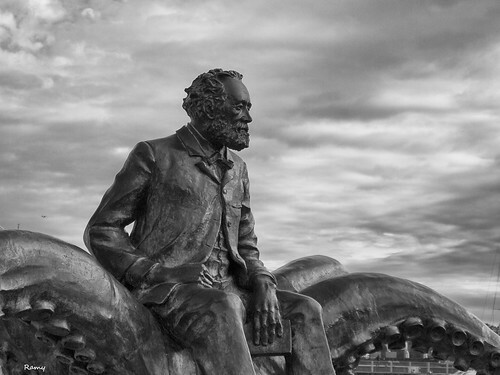 Happy birthday to Jules Verne (8 February, 1828 – 24 March, 1905)! "The sea does not belong to despots. Upon its surface men can still exercise unjust laws, fight, tear one another to pieces, and be carried away with terrestrial horrors. But at thirty feet below its level, their reign ceases, their influence is quenched, and their power disappears. Ah! sir, live--live in the bosom of the waters! There only is independence! There I recognise no masters! There I am free!" One of my early introductions to SF! But at thirty feet below its level, their reign ceases, their influence is quenched, and their power disappears. Ah! sir, live--live in the bosom of the waters! There only is independence! There I recognise no masters! I also have to share a tidbit from years of teaching Latin class. When I first began teaching Latin in 1996 and we hit the vocabulary word nemo, I would mention that there was a story that took place a l-o-o-o-ng way under the sea, and the main character was named Nemo, and Disney made a movie about it ... and someone would eventually answer 20,000 Leagues Under the Sea. Then, after a two-year gap, I began teaching Latin again in 2004, and when I went into my song-and-dance about this vocabulary word, they all brightened up and said, Finding Nemo!!! I think they were as amused by my astonishment as I was by their excitement! Oddly enough, I've never read any Verne. Not sure why, considering I inhaled scifi as a young girl. But, still, Happy Birthday, Mr Verne!